In the not too distant future, the main opposition, National Democratic Congress will outdoor modalities for the election of candidates to hoist the flag of the party at all the 270 constituencies across the country who are committed to shore the fortunes of the NDC in the 2020 general elections in democratically contested primaries. For sitting parliamentarians, this is the time to test whether they have lived to the mandate given to them by the electorates by canvassing for a renewal of the mandate and for starters, an opportunity to prove their mettle. One such debutant in the contest is likely to be Ndemele Magdalene, who prefers to be known and called "Baby" an affable young lady from the Krachi West Constituency. 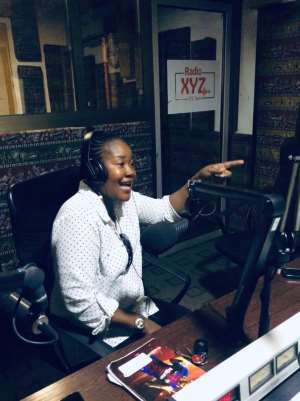 Speaking to Kwadwo Danquah of Radio XYZ in Accra on the night of Thursday, July 4, 2019, "Baby" who was circumspect of the fact that the party has not given probable candidates the opportunity to make open declarations of their intentions reluctantly said if God willing she may be contesting for the NDC parliamentary candidacy if given the nod by the delegates in accordance with the procedures of the party that shall be agreed upon. In her statement, she bemoaned the nosediving electoral fortunes of the NDC as a party in the constituency while making a comparison of figures from the 2008, 2012 and 2016 general elections. In her estimation, this increasingly poor performance is grounded in a discontent of party faithfuls in the constituency who are constantly intimidated to cow into their shells by people at strategic positions. She is therefore resolved to unifying the front of the party and bring back dissident groups who have given up on the party in the constituency. When asked why she is not unifying the party now, she said she will be prevented by a hierarchy of clique benefiting from the rift existing in the constituency. She also said hers is a call from delegates and the grassroots supporters of the party who are privy to her assertiveness and leadership potential and thinks the time is right to salvage the dwindling fortunes of the NDC in the Krachi West constituency, give them an opportunity to be able to constructively critique without being tagged and intimidated. Concluding, she called on delegates, the party and the people of Krachi West constituency to repose confidence in her as she is coming to right the wrongs of yesteryears and make Krachi great again.